Harassment and bullying occur in some form and at some point in most workplaces. It is a problem management cannot ignore. Apart from being a workplace Health & Safety issue it is highly detrimental to business and very harmful to the victims. Employers need to implement policy and have a formal process for dealing with issues of this nature. 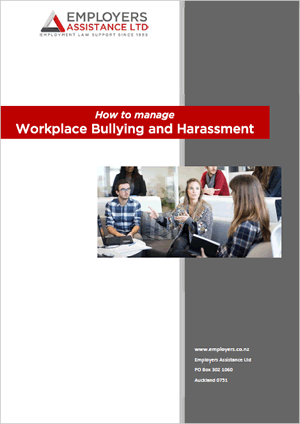 Following the Australian model WorkSafe NZ released guidelines in February 2014 formalising the recognition of workplace bullying as a prevalent workplace hazard. Updated recently by our in-house legal team in 2018, this eBook provides guidance to Employers for formal systems for dealing with complaints of bullying, harassment and discrimination. Download, read and adopt our policy documents, systems and letters to protect your business and staff from these situations. This publication is provided in PDF format with the policies, and sample letters and a policy in Word format. Buy online, get your password immediately and get to work instantly. "..I think it's the best value for any business that money can buy, convenient and brilliantly simple to use.."